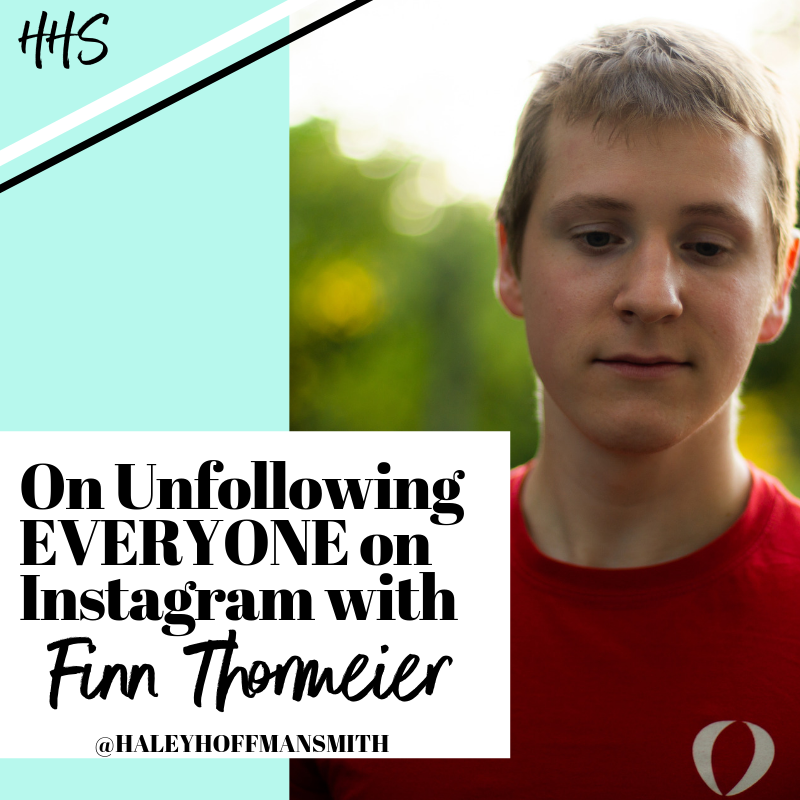 Finn Thormeier made an impulse decision a few weeks ago to unfollow everyone on Instagram. Here's what he learned. Finn Thormeier is the founder of internet company Project 33, digital nomad, and certifiable social media influencer with nearly 27,000 Instagram followers. Witty, smart, and willing to share all of his adventures and tips with his followers, I’ve admired him and his ability to build community via social media for years. A few weeks ago, Finn made a surprising decision: he unfollowed everyone on Instagram. My first thought was – “Wow. I wish I could do that.” The image of a totally empty feed sang songs of glorious productivity in my “what if” scenario. It’s no secret that I open Instagram far too often in a given day. It’s a personal choice. Social media is a lifeline to so many. I like staying in the loop, and I also want the people I follow to know I’m there to support them. But at what cost? Finn and I sat down to chat about his impulse choice to unfollow absolutely everyone. His nuggets of wisdom and insight certainly prompt some consideration, and he’s inspired many to already follow in his footsteps. How will you reclaim your relationship with social media? HHS: How did you decide to unfollow EVERYONE? FT: Very randomly. I was sitting on the balcony and a was listening to music, journaling and reading an article about Benjamin Franklin I think. Don’t ask me how I stumbled upon that article. I had played with the thought earlier and I realized that I spend a lot of my time documenting. I wanted to spend more time working on myself and I was inspired. So I immediately opened my app and started to unfollow everyone from the top down. Not thinking about it or trying to filter. That feeling of being inspired was the biggest contributor. As I said, I had played with that thought already for a long time but never followed up with any action. I also didn’t write down pro and contra list and came to a “logical conclusion”. It just felt right in the moment. When you feel inspired, make sure to take the first of action to realizing that goal. Don’t postpone. Don’t waste that burst of energy, you need it. HHS: Has it resulted in anyone unfollowing YOU? FT: Oh yes. Lots of people. I think around 300. HHS: That intrigues me the most, and I think would be the top concern for many (myself included). But it begs the question: do we enter into this “follow for follow” relationship with others for personal gain, or because their content is somehow serving our lives? And if people are only following us back to keep US following them… what does that say about our content? I actually think it’s pretty phenomenal that you ONLY lost 300 followers after you unfollowed thousands. It’s a huge testament to the quality of your content. What’s been the most surprising part for you about taking this leap? 1) was realizing how much I’m actually addicted to Instagram. Or rather how much I used Instagram subconsciously to distract myself. I started noticing how I just opened to the Instagram app and tried to refresh my feed. But obviously, there was nothing there now. So technically, there was no point in doing it but it was just muscle memory. Before I didn’t notice because then there was actually something to do. Stories to look at, pictures to like. I realized how often I open Instagram for no good reason whatsoever, just out of habit. No intention. 2) I realized the power of using the energy you feel when you have a random moment of inspiration. Had I had that thought of unfollowing everyone when I was sitting on the balcony but I would’ve said “I’m gonna unfollow everyone but let me do it tomorrow. Let me put it on my to do list”, the chances of me ACTUALLY doing it would’ve been drastically lower. When you feel inspired, make sure to take the first of action to realizing that goal. Don’t postpone. Don’t waste that burst of energy, you need it. 3) It’s how afterward I literally got hundreds of DMs of people who told me they just unfollowed a majority of their people and cleaned up their feed and got more intentional with whom they follow and why. It’s humbling to see and also makes me happy that I could at least inspire a couple of people to be more intentional. I never set out to do that, I just shared what I did, there was no advice or call to action in it. People decided on their own that it was time to take action. HHS: Do you worry that you’ll miss out on the big things happening in your community’s lives? FT: It’s not too bad right now, but yes, a little bit. It’s actually not so much community. I actually feel I got better in touch with my community. As I’m spending less time mindlessly scrolling, I have more time actually responding to DMs and comments. I ask more questions on my stories and read all of them because I need to be more intentional how I get information from them. I still look at other people’s content and engage with it. It’s just more intentional now because I have to specifically look them at and search for their profile. On the other hand, one big reason for me to unfollow people was to remove this feeling of trying to keep up with everyone. I think the idea that I’m missing out on something was much stronger when I was following people. Especially people who have no impact on my life. HHS: What has helped you the most about a clear Instagram feed? FT: Being more intentional with whom I engage, fewer distractions, becoming more self-aware of eg. my “addiction”, creating more and consuming less and again as I said, I feel I’m more in touch with my community, not less. It’s certainly something to consider! A big thanks to Finn for inspiring us with new ways of thinking, and for always being so transparent about his choices and motivations. It’s inspiring for us all. Subscribe to The HHStle for productivity tips, entrepreneurial resources, and the “Weekly Woof” column by my golden doodle, Fitz Carlton, every Monday morning.